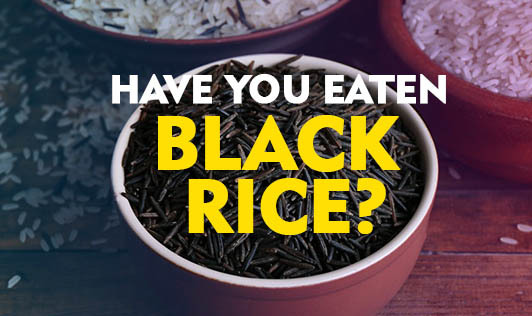 Have You Eaten Black Rice? A research study on black rice that I read recently got me curious about this grain, which is rarely seen in most parts of India. The study says that black rice which is native to China and Thailand, has a higher quantity of anthocyanins (a type of antioxidant) compared to other varieties of rice. It even beats blueberries in its antioxidant content. Secondly, black rice is said to have much more vitamin E and fiber than other varieties of rice. This would perhaps put it lower than other varieties of rice, on the glycemic index scale. Black rice is grown and eaten in North Eastern parts of India. Black rice which actually looks more purple when soaked in water, is popular as a pudding made with rice and milk in Manipur. This variety of rice takes longer to cook than white rice because of the bran. Next time you visit North East India, don't forget to try out black rice for its health benefits. You might even bring back some with you if you like the taste and flavor.